Lori grew up in Connecticut, but was called to Vermont’s Green Mountains for college. After graduating from UVM, she spent a season as farm apprentice in Maine. During these 5 months spent living in an electricity-free trailer in the woods, she fell in love with growing food. From there, Lori went on to work on a teaching farm on Martha’s Vineyard, start a high school ag program in Connecticut, tend to school gardens and teach high school science in Colorado. In 2016 she moved to Missoula, and can be found mountain biking, snowboarding, sewing, and generally recreating outdoors. She has an Environmental Studies degree from the University of Vermont, and a Master’s degree in Education from Western State Colorado University. Originally from California, Ruth made the move to Missoula in 2010 to pursue her degree in environmental studies. She has since then found herself working with a number of nonprofits in the area, and has most recently received her MBA after completing her final study in zero waste food business. When she's not in the office, you can find her experimenting with container gardening, cooking, drinking tea, or hiking. Samantha came to Missoula from the big sky country of southwestern Montana to pursue an education in Visual Art. There, she found herself growing an interest in food and community which landed her interning at the PEAS Farm and pursuing an Environmental Studies minor. She started with Garden City Harvest as the PEAS Farm caretaker, spent some time as the River Road Farm Assistant and now is managing operations at Youth Farm. When she’s not watching the magic happen in the greenhouse or out in the fields, she enjoys outdoor adventure, sewing, making art, cooking, biking, and good books. Amy grew up in the Bitterroot Valley and is a Montanan through and through. She graduated from Western Washington University with a degree in Environmental Studies. Following college she returned to Montana, settling in Missoula. Amy’s first experience with Garden City Harvest was as an intern learning the fundamentals of sustainable farming at Orchard Gardens. She then served two years as a FoodCorps service member alongside GCH and Missoula County Public Schools focusing on nutrition education, school gardens, and local procurement for the school district’s food service. Amy is excited to continue working with the Farm to School team in a new capacity this season. When Amy is not in the school gardens, she can be found hiking, skiing, biking, cooking, and traveling. Genevieve hails from the piedmont of North Carolina. She fell in love with sustainable agriculture in Vermont, and studied the subject in Missoula, Montana where she earned her Master’s of Science in 2006. In her work at Garden City Harvest, she heads the Community Gardens team and celebrates the work of our farms and gardens through events and outreach. Prior to joining the Garden City Harvest crew, she worked for the Intervale Center, Sierra Nevada Alliance, Lake Champlain Land Trust and Audubon Society of Portland. She enjoys writing, reading (but not arithmetic), gardening, adventures that require a tent and good walking shoes, and, like her grandfather, the feel of the sun on her back. Maria came to Missoula from Michigan in 2005 to study Spanish and Nonprofit Administration at the University of Montana. After graduating, she did some world traveling and completed a year of service as an AmeriCorps VISTA (Volunteer in Service to America) in Austin, Texas. Some of Maria’s favorite things are watercolor painting, cooking, playing guitar, outdoor adventures, and tending to her rooftop container garden. Originally from Salt Lake City, Utah, Emily earned a degree in landscape architecture from Colorado State University before discovering the wilds and wonders of Montana. Her love of all plants has provided her with a variety of professional experiences around the West, including wilderness trip-leading, ecology research, farming, permaculture and landscape design. Emily has been involved with the community garden program as a gardener, leadership committee member and compost instructor. She encourages everyone to grow some of their own food and to have fun doing so! Laura is a long time keeper of nonprofit and for profit books. She keeps Garden City Harvest’s finances ship-shape. In her free time, she and two of her three sons play with swords (in other words, she is the Director of the Missoula Fencing Association). Jason is originally from Ohio, and has lived in Missoula since 2004. He is a lover of all things kale and garlic, and is devoted to working with kids at the farm or in school gardens. He has a Master’s degree in Environmental Studies from the University of Montana with a focus on place-based education and sustainable agriculture. Tami’s academic background includes a Bachelor’s degree in Ecology, Minor in Dance and a Masters in Teaching. Her professional pursuits have been driven by a desire to build healthy natural and social communities. She has done this through youth work centered in urban ecology, wilderness, and agriculture. Tami has developed, managed and taught several at-risk youth programs through work as environmental educator, alternative high school teacher, wilderness guide and behavior consultant. She now brings her commitment to empowering young people to Garden City Harvest’s Youth Harvest Project. She attributes her success in life to a combination of hard work, compassion for others, a good sense of humor and lots of dance parties! A Missoula native, Tracy Potter has been a mainstay at Garden City Harvest’s Youth Farm since 2010. Tracy started out as a member of the youth employee crew and built her considerable skills over time to become the Youth Farm apprentice. With close to a decade of experience farming this site, Tracy is an invaluable member of the team. When she’s not helping run the show at the Youth Farm, Tracy can be found hiking, tending to her cat Ashes, or getting lost in a good book. Greg has served as the River Road Neighborhood Farm and Community Garden Manager since 2002. Under his management, the farm produces more than 30,000 pounds of food in an annual growing season averaging just 120 days. In a past life, Greg cooked for and managed the kitchen of Second Thought Restaurant. He now uses his kitchen creativity in cooking up the menu for Garden City Harvest’s Wintergreens locally grown supper and fundraiser. Greg is a great advocate for grizzly bears and loves a good funk band. Ethan has a Master’s of Science from the University of Montana and works to keep Garden City Harvest facilities and general operations running smoothly – especially at the PEAS Farm. He enjoys hunting, fly fishing, and lying in the summer sun with his daughters, Harley and Wylie. Clare grew up in Salt Lake City, where she spent a lot of time playing in the dirt. She moved to Missoula to pursue a degree in Ecological Restoration and fell into farming along the way. She has worked on community garden initiatives in Salt Lake and served as assistant manager of the UM Dining Garden while earning her degree. She started with Garden City Harvest as the apprentice at River Road Farm and moved to Orchard Gardens two years later, first as the assistant and now as the manager. When she's not on the farm, she enjoys eating good food, getting lost in the mountains, and reading good books. Dave is a lover of plants and the soil that sustains them. 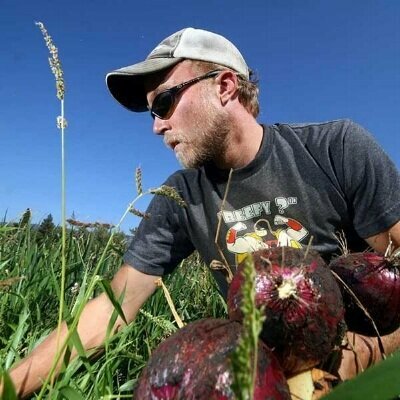 He has a Master’s degree in Environmental Studies from the University of Montana where he focused on seed saving at the River Road Farm. Off the farm, he enjoys tending to his red worms and growing mushrooms. Originally from Southeastern Virginia, Mark moved to Montana in 2009 in order to develop his skills in sustainable agriculture. While pursuing his degree in Environmental Studies at the University of Montana, he started an internship with Garden City Harvest and never left. At the Youth Farm he works with and manages the youth crew, teaching skills, and growing some tasty veggies. Jean grew up in a small farming community in the Midwest where she first learned the value of community and of neighbor helping neighbor. She’s dug deep into the Missoula community, having led the boards of the YWCA, NCBI, Run Wild Missoula, the Women’s Hockey Association. Prior to joining Garden City Harvest, Jean worked for KECI-TV – starting at the ground level and working her way up to Station Manager of a three station working group. She is proud of her role as soccer coach to many Missoula girls since the mid-1990s.